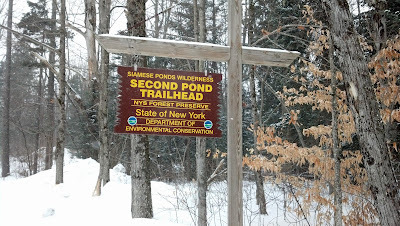 The Second Pond Trail is another one of the fine trails in the Siamese Ponds Wilderness that was designed for backcountry skiing. 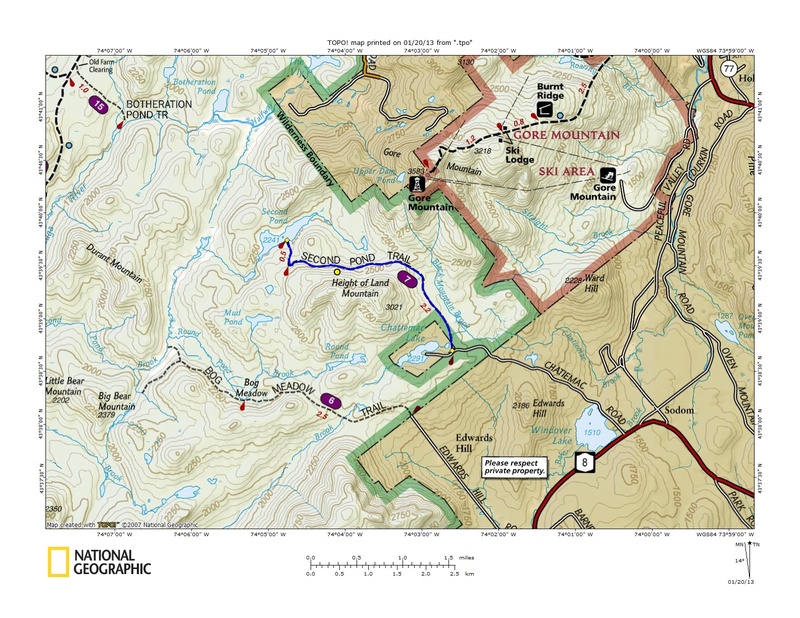 The trailhead is on Chatiemac Road, just off Route 8, and just south of Gore Mountain Ski Area. The trail is not a long trail, being 2.7 miles to Second Pond, but it is a nice intermediate ski route containing several rolling hills. 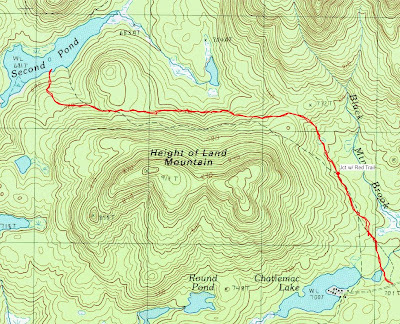 Last winter I had snowshoed the first half of this trail before turning south to to bushwhack to Height-of-Land mountain. 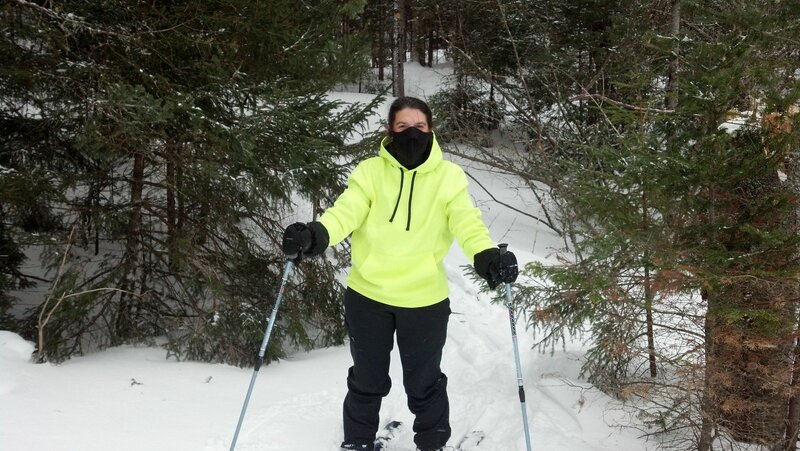 Today Leesa and I had a few hours to get out for this ski trip. We weren't sure the skiing would be any good. 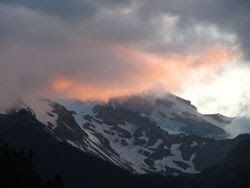 The forecast called for temps in the mid 30's and the possibility of some snow squalls or rain. 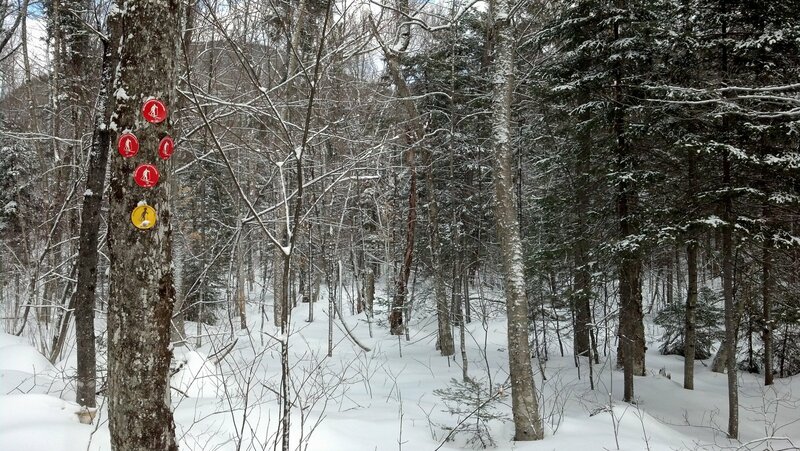 Fortunately this trail is at an elevation of 2200-2500' and the snow cover was great. We had 4 inches of nice powder on top of the snowcrete below. The trail crosses many tiny drainages which weren't frozen, so a little care was needed. 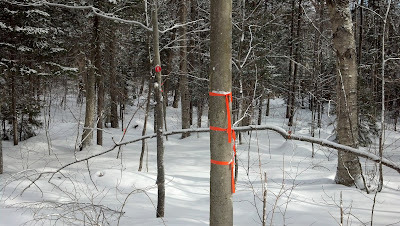 We also noticed a new trail. 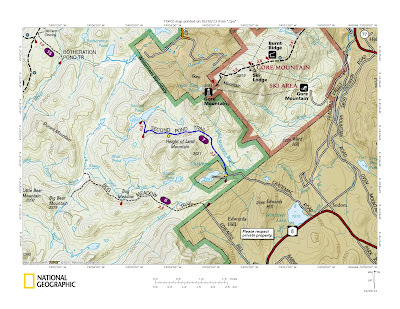 At .8 miles from the trailhead, there is a new red trail heading north. 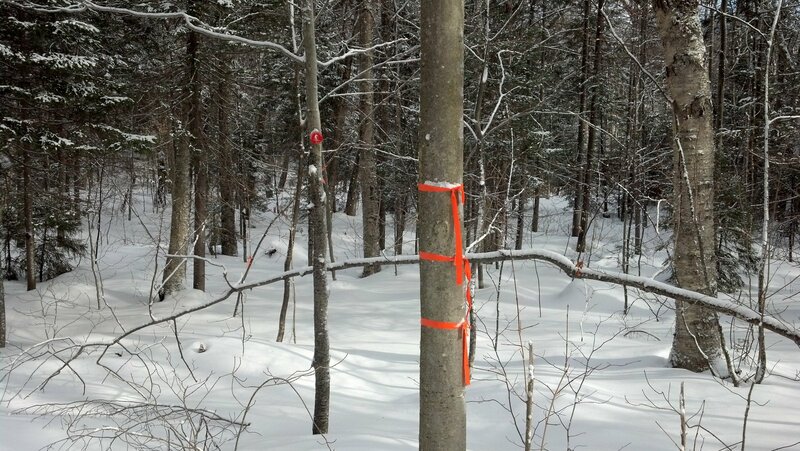 The flagging from the route marking is still on the trees and see saw red trail disks following the flagging. 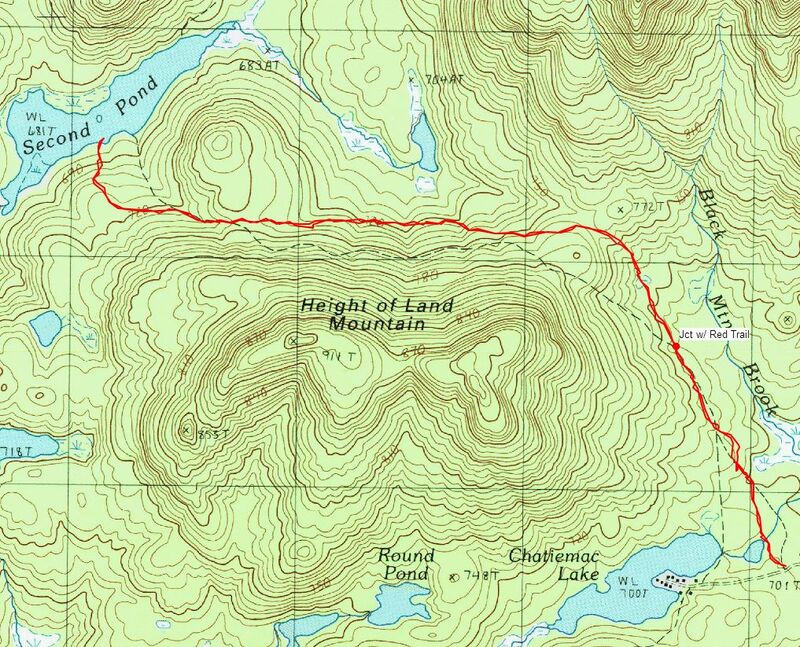 We didn't have time to follow this trail so we'll have to go back to see where it goes. 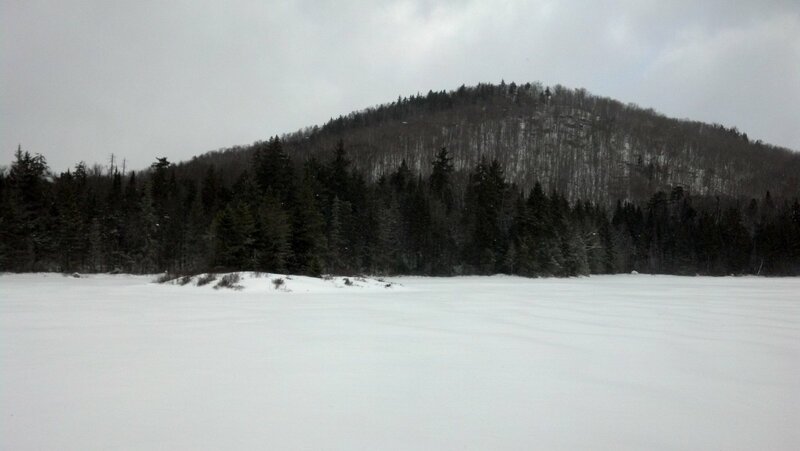 After about an hour and a half, we reached Second Pond. 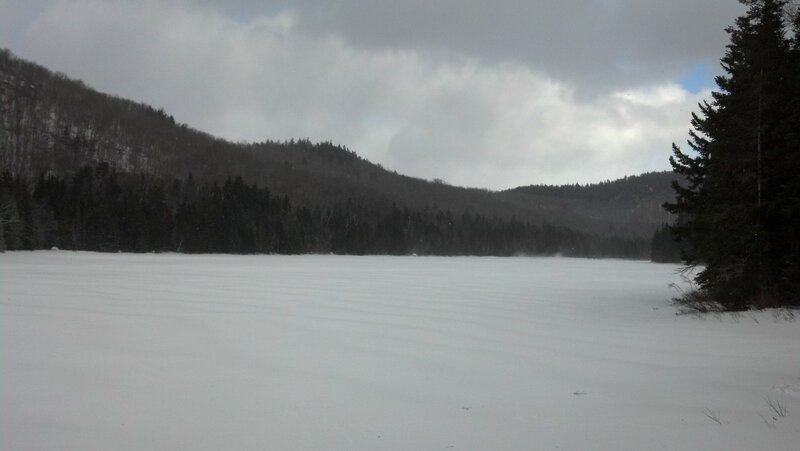 It was quite windy at the pond and snow devils were swirling across the pond with great speed. 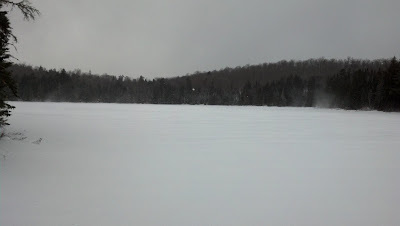 There is a designated camping spot at the shore of the pond but we didn't look for it. It was a nice ski, and the snow conditions were a pleasant surprise and an added bonus. The weather was interesting with blue skies, followed by white out snow squalls and back to blue skis. Our skis stuck to the snow occasionally on the uphills, but the snow broke loose as we began our glides downhill.